Calling out to all students! Student bands/artists and more! Check out below to see how you can get 10% discount! Check out our package deals to find out all the information you need! Need more info then Get in Touch! To take advantage of the Student Discount, a valid student card is to be presented at the time of delivery in the name of the hirer. If this is not possible, the discount will not be honoured. If a valid student card is presented at the time of pick up, the discount will not be reinstated. The discount must be claimed for at the time of hire and must be asked for directly; JB Sounds will not ask if the hirer is a student at the time a hire is requested. JB Sounds reserve the right to deny Student Discount at any time. This cannot be used in conjunction with any other offer. 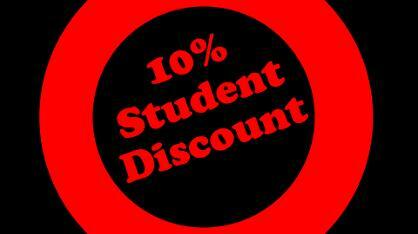 Here at JB Sounds we are offering 10% Student discount on all package deals and dry hires! Are you a new/established college band, solo artist or DJ looking to start gigging around Cornwall but you don't have a PA system to hand or the funds to buy one? Why not hire? Here at JB Sounds we have a range of PA systems available any day of the week for any kind of event. Our systems start from £50 per day and we do all the hard work of transporting and setting up the gear for you.